Did you know that there are different types of jellyfish? 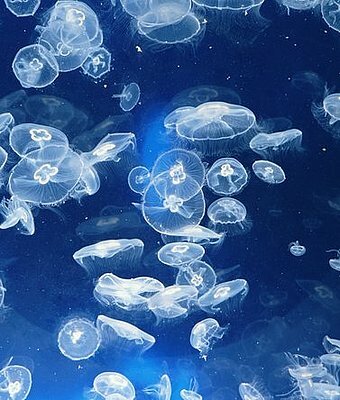 In fact, there are more than 2000 different species of jellyfish according to Smithsonian Magazine. Here is just one. Check back as we continue to add more animals. Aequorea Victoria. This jellyfish is also known as the crystal jellyfish. That makes it sounds like it’s got a great glittery look and it certainly does have a neat translucent appearance. However, it’s also cool because of how it has helped science. It has a protein in it called GFP that has been used in a number of scientific experiments including the creation of a rabbit that glows underneath blacklights! GFP has also been used to help study cell processes to help solve serious health problems like Alzheimer’s. In terms of the jellyfish itself, this protein makes it look a really cool fluorescent blue green color.